Mason jars aren’t just for the kitchen! They are also great for storage in the bathroom. 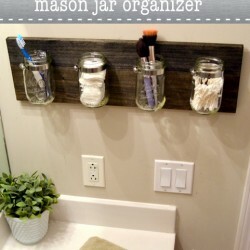 Check out how Casey from DIY Playbook created this farmhouse chic look for storage in her bathroom. Click HERE for the complete tutorial of how she did it! 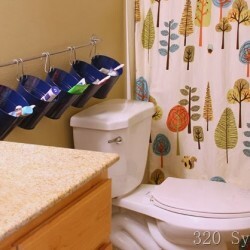 You can never have enough storage in the bathroom! However, if you have a smaller bathroom, sometimes storage is limited. 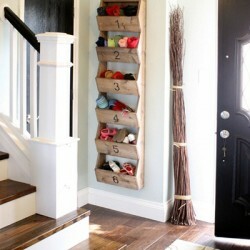 Wendy from Designed to Dwell shares a great way to create some extra storage by making your own floating shelves. Click HERE to view her complete tutorial. If you have a large family, you know how difficult it can be to store all the different toothbrushes and toothpaste in one bathroom. Melissa, from 320 Sycamore, shares how she won the battle against toothbrush chaos in her home! Click HERE to view the tutorial of how she made it with dollar store buckets. 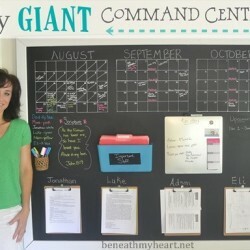 If you are a visual person, you are gonna love this Giant Command Center Wall that I created for my office. Click on the picture to check out all the organizing details! 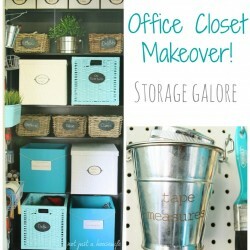 Stacy, from Not Just a Housewife, knew that her office closet needed a makeover. It was difficult to find the things she needed from this closet. 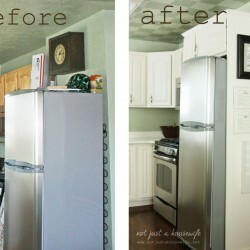 So Stacy gave her little closet a makeover making it both beautiful and functional. To see how she did it, click on the picture below. Need an idea for creating extra shoe storage in your closet? 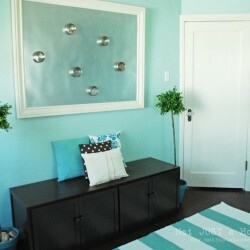 Whitney, from Shanty2Chic, shares how she created this easy and inexpensive (only $4.00!) shoe storage for her closet. It’s a great way to store your high heel shoes! Just click on the picture to view the complete tutorial.